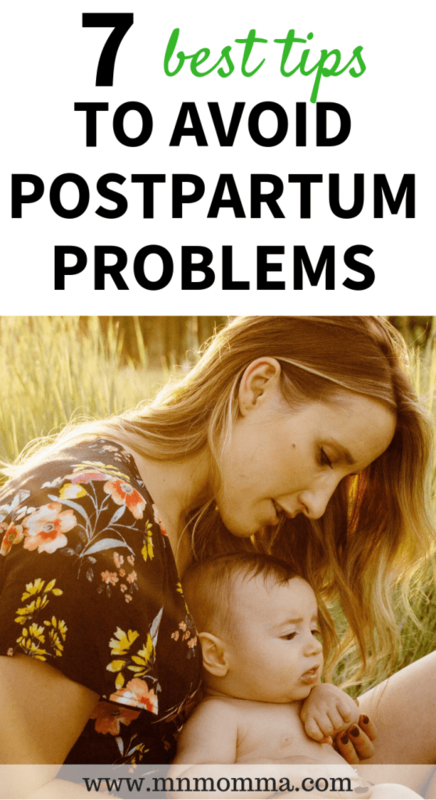 7 Common Postpartum Problems and How to Avoid Them is a guest post by Katie Pickett at Joyful Messes, The Postpartum Cure, & now… The Belly Only Pregnancy! Katie is not only a Pre/Postnatal Exercise Specialist, but also a mom of three! This makes her a great resource for moms looking to get and stay healthy during pregnancy and after giving birth. Most of us endure the third trimester, waiting for the day when all of our pregnancy problems will be gone, and our new baby will be blissfully placed into our arms. 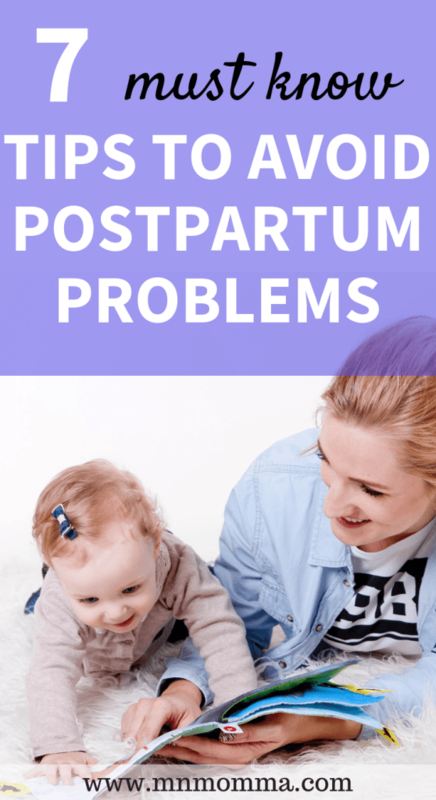 With the end of pregnancy, a whole new set of postpartum problems show up, most of the time unexpectedly and unwanted. The pregnancy exhaustion doesn’t even compare to the new-baby, postpartum exhaustion in the sense that they are completely different. 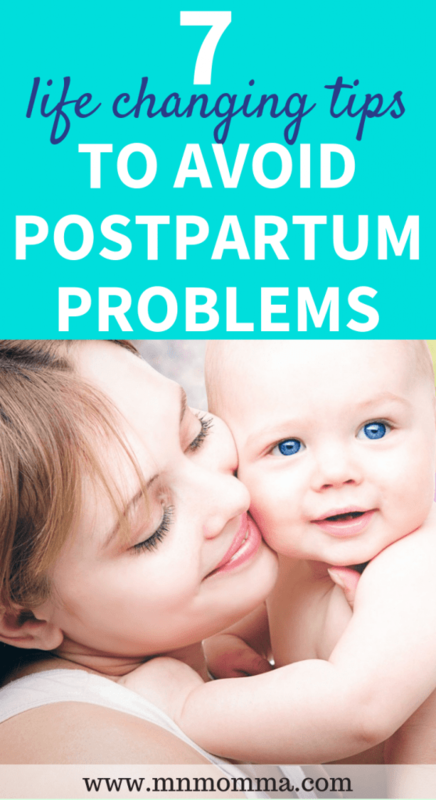 Here are some common postpartum problems that pop up after baby arrives, and how to avoid them. This is first because milk supply is one of the most difficult and rewarding aspects of postpartum life. Many mamas worry about milk supply and producing enough milk to properly nourish their new baby. You can ensure you produce enough milk by eating properly for breastfeeding. This is a really important piece because if your body doesn’t have the proper nutrients, it can’t optimally function and produce breast milk. In addition to nutrition, nursing your baby as much as you can will keep your supply healthy, or boost your supply. Your body creates breast milk as it is demanded, so if you let your baby nurse and demand more, it will encourage your body to produce more milk. If you produce too much milk, you can come down with mastitis, which is where you get a clog in a milk duct. If you come down with this, as I did a few times from too much milk, you can squeeze excess milk out, and massage the sore breast in the shower. It is painful, but I was able to break up the clog, and express some extra milk to avoid an infection. Remember that breastfeeding doesn’t have to hurt! Check out Breastfeeding Problems & Solutions for more details on solving common breastfeeding issues. This is a HUGE problem in the postpartum period because so many mamas are worried about the weight they’ve gained, the weight they are still gaining, or the weight they aren’t losing. Losing weight postpartum doesn’t have to be stressful, overwhelming or impossible. If you follow a proper nutrition plan, your body will naturally want to let go of the fat it stored during pregnancy for the purpose of producing breast milk. By feeding your body a diet rich in nutrient-dense foods, your body will feel safe to let go of fat. If there is a lack of nutrients, your body stays in a storage mode in case it needs extra nutrients. Healing foods like blueberries, sweet potatoes, salmon and others should fill the majority of every meal and snack. Feeling like every one else is losing weight breastfeeding, but you’re not? You’re not alone! For more, check out Losing Weight While Breastfeeding – When It Doesn’t Happen. The “postpartum poop” and “pee” have a reputation for a reason. It isn’t comfortable at all. Following a healthy postpartum diet, as mentioned above, will really help keep your bowels moving, to make things more comfortable. The stool softeners are also very helpful, in addition to drinking a lot of water. I personally didn’t have much pain going pee postpartum because I sprayed a lot of the cooling, numbing spray every time, which really helped keep sharp pain or soreness at bay. Speaking of life savers after giving birth – these postpartum essentials are a must! As your hormones fluctuate up and down, things can get gritty emotional, and your normal sense of happiness can seem to go up and down more than you’d like to admit. Again, I am a huge advocate of diet, and balancing your blood sugar has a massive effect on your hormones and mental balance. That being said, there are also supplements like Vitex or Chasteberry that can improve milk supply in addition to help balance hormonal mood swings. Getting enough sleep is basically impossible, so having some patience for yourself during this time is really the best thing you can do. Postpartum hormones slowly start balancing out as time goes on, so remember it is temporary! If you’ve been looking for an easy to follow, comprehensive healthy eating plan – Katie’s Postpartum Cure program has it all! As a busy mom, my favorite is the on the go, make ahead breakfast recipes – I LOVE them! With the hormonal fluctuations comes symptoms such as hair loss and acne as the changes affect your body. Of all the postpartum problems you can encounter, the hair loss can be shocking at first, but it does grow back! I notice hair loss usually around 6 months postpartum. It feels like I am shedding all over, and can be concerning, but it is normal, and it usually lasts just a couple months. If it continues, there could be an underlying issue going on. Acne is also a temporary symptom to the hormonal changes, and it will get better. I personally deal with small bouts of postpartum acne since weaning, which I use 2.5% benzoyl peroxide with non-comedogenic products to help crack down on the small bacterial upsets due to hormonal shifts affecting the oil in your skin. This is totally not fun to talk about, but completely common with postpartum mamas. Things get tricky with the extra pain medication and lack of sleep, so your body has trouble functioning normally after birth. This is not fun, and even after the postpartum bleeding stops, many mamas still wear a pad because of accidents. 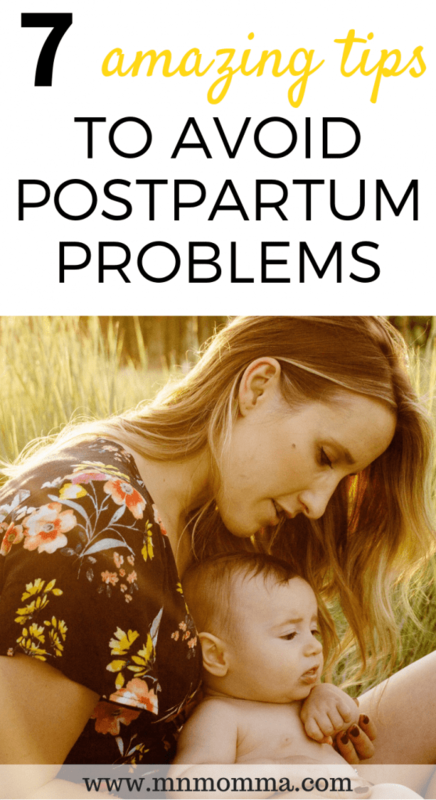 I’ve had plenty of them myself, and this is not a fun problem to deal with, but with the right amount of work and therapy, it can be resolved dramatically and doesn’t have to be one of the worst postpartum problems. My 3-week Ab Rehab and Pelvic Floor Restore program is really what has dramatically improved my ability to control my bladder. I wasn’t able to do jumping jacks until I really focused on my abs and pelvic floor, which now I can successfully do jumping jacks, and I am still working on the jump rope portion. Click here to check out Katie’s Ab Rehab and Pelvic Floor Restore program. 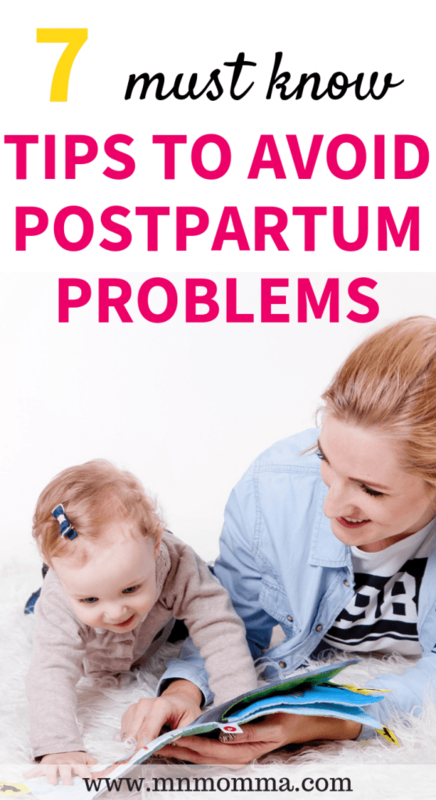 Postpartum life is full of blissful moments with a new baby, but it can also be full of lots of bodily issues and problems that are unnerving and surprising. Preparing mentally to expect and handle these postpartum problems is the best way to maintain a positive attitude and handle postpartum life like a boss.